I went camping this weekend, and brought along my copy of The Orphan’s Tales: In the Night Garden which is one of the best fantasy books I recommend to all my friends, which uses a lot of the structure of “story within a story” of the classic Arabian Nights. It reminded me of one of my favorite GM-less RPGs, 1001 Nights. 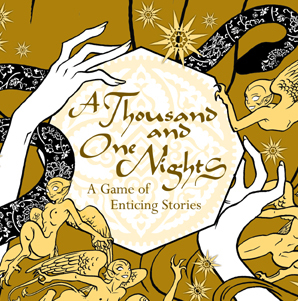 1001 Nights is a game where you play as servants in the Sultan’s Court. The court is not a safe place- it is rife with danger and intrigue. As a servant, you are vying for power here, and you are all playing petty power games… which, taken too far might incur the Sultan’s wrath and get you beheaded. Each player takes a turn telling a story like this. While telling the story, each of the other players can ask questions about the story (“But surely the Tyrant had at least one good noble quality? Yes?”) and they place forth a die on the table. When the questions get answered, the dice are rolled and the die is either awarded to the current storyteller, or to the question asker. These dice fuel the Court drama – you use them to protect yourself from the threat of death, to fulfill your character’s ambition, or, to flee the Court altogether. Depending on the characters you create, the ambitions they hold, and how they treat each other… you may have protagonists who are quite terrible people fighting for power, or hapless folks caught in a terrible situation. I had a slave musician boy, whose ambition was simply to get to play one of his OWN songs. – Fictional positioning/story capital driven play. It’s definitely one of the games I recommend nearly everyone play just to see how far rpg mechanics can go outside of the standard GM/Players with one Character each traditional set up that forms most rpgs. A collection of biographies of 8 women from the Tokugawa period, all collected by a single author only known as “Mirror”. Each account ends in a final chapter where the calligraphy becomes entirely illegible, and it has been a massive mystery that has spawned several conspiracy theories as to what happened. The actual writing is fairly captivating, and has left more questions than answers. The Destiny Diaries is a setting idea for Sorcerer for the Magical Girl anime/manga genre. The protagonists are all young women who have spent a lot of time studying, thinking about, and obsessing over the Destiny Diaries – until they finally get to see them in person at a museum… and then they acquire their Destiny Powers, and find their lives changed forever. Adolescent girls in Tokyo, caught between self discovery and social pressures… and now sorcery. Sorcery is bright light, stars and animal motifs and sigils and tarot cards. The world is shaped by “Calamity Spirits” which change the luck and thoughts and feelings of non-sorcerers. Self Esteem – character’s ability to feel good about themselves and their expression of their feelings, and being supported in it. Humanity checks are places where you swallow down your feelings due to social pressures. Humanity gains are when you do something that makes you feel better about yourself. Friendship – character’s supporting their friends, with both emotional support and actions/resources. Humanity checks are where you have to break commitments, or leave a friend in a lurch, cause a loss of trust. Humanity gains are when you help support, protect, and show good feelings to your friends. Humanity 0 – at humanity 0 the character gives up being one of the Destined. She has to pass her Destined Light (bound demon) to another character and simply leaves the scenario – her family moves, she transfers to a distant school, etc. When non-Sorcerer characters hit Humanity 0, they say an ugly truth about how they see things going in the future… and a Calamity Demon is born. Lore is actually about destiny and karma. How to shape the future. That said, the entry point for the heroines is over-studying the Destiny Diaries, forming theories about it’s secrets, and so on. There are two kinds of demons in this setting. “The Destined Lights” are also sometimes called “Lucky Stars” which are bound to the protagonists. Each Destined Light is a form of magical energy imbued into the heroines, and allows them to transform into their magical girl form. The Destined Lights often communicate with the heroines by having them “think strange thoughts”. They’re not antagonistic, but they do have their wants and Needs and will apply pressure where they can. Telltales: Magical girls end up with a small “birthmark” looking like a silouette of an animal, a star, moon, etc. Desires: The 8 Desires listed in Sorcerer work just fine. Four of these are easier to apply to the classic heroic types (Mayhem, Creation, Competition, Knowledge) and four work well for “anti” Magical Girls (Corruption, Mischief, Power, Sensual Gratification) at least as far as the usual genre expectations go. Power: Most are in the 4-8 range of Power. Every Destined Light has a unique Perception. This has to do with people’s destinies or inner feelings. “People destined to be unlucky in love” “People destined to do something great”, “People destined to face ruin, soon.” etc. The GM should totally use these to set up an additional set of potential plot issues by what the heroines find out and decide to do to deal with these things. Vitality – The healing power of Vitality is applied only at the beginning of a tranformation into a Magical Girl. Damage/attack powers: All damage powers are non-lethal damage against humans. Calamity Spirits cannot be Bound and do not lose Power from having their Need go unmet. Telltale: Glass in the area mysterious forms cracks, often. Power: usually equal to the maximum Humanity of the person who caused it to come into being. Warp – often used to sabotage things, cause accidents, etc. Athlete – Maybe you’re a track star, or a judoka. You’re pretty fit. Genki Girl! – It’s less physical fitness and more cheery hyperactivity. Goof off – Skipping class to go out and have fun has you running a lot more than you’d think. Scrapper – you grew up with the tough girls and you can toss punches. Worker – you do stuff like lift things, bike delivery, etc. Makes you more active than many! Bookworm (Stamina 1) – or maybe gamer. you don’t go out much or do a lot. Aristocratic – Social grace, popular. People want to be you or your best friend. Contrary – You push people away and act cold, but you’re really their friend. Hedonist – Sleep. Food. Sleep. Wonderful. Prodigy – You’re on track to going to a great school with success ahead of you. Tough Girl – Aggressive, in your face, what are you going to do about it? Theorist – You’ve dived deep into the theories, developed your own and you have insights. You want things to stay the same – but everything is changing. Friends are leaving, or changing in personality. Family is breaking up. Your neighborhood is changing under your feet. How much will you use your Sorcery to avoid change? You’re not really sure which direct to go, or, if anything, you’re stuck in a routine. You can’t see a future for yourself. How much will you use your power to force the world to change, and will you do it thoughtfully or just lashing out? Your family has pretty clear ideas on what you should do with your life. But they’re very different than what you want to do. And it’s crushing you. Slowly. What’s the way out? What do you do to keep your sense of self in the face of pressure? You are currently browsing the Deeper in the Game blog archives for September, 2014.